The book "The networked shop"
Thanks to digitalization, shopping is possible anywhere, anytime. Your customers can make a purchase in store, online from the convenience of their own home or via an app on their mobile devices. Offer your customers a shopping experience across the channels and book the omnichannel solution best suited to your business. Make the most of the benefits of each specific channel and you can be wherever customers are looking. The various touchpoints show customers that you offer a fully integrated concept, encouraging them to decide on your products as part of a seamless process – online, on their mobile device or in store. Brodos.net offers high-performance omnichannel products that have stood the test of time. As a customer you can benefit from the continuous improvements made to the systems and from the market-leading technology for the retail sector – scalable for individual retailers, SME’s or large concerns. brodos.net is proud to offer solutions tailored to various branches. As suppliers and manufacturers are linked directly to the brodos.net B2B platform you can benefit from a wide variety of products, offers and relevant manufacturer information for your branch. The brodos.net backend cloud can be combined with all common ERP systems, the perfect solution for managing your omnichannel solution. The brodos.net system takes care of everything for you, from merging all measurable customer activity over the various channels to ultimately fulfilling orders. Boost coverage of your marketing messages and use our email marketing - target customers with specific information and offers tailored to their needs. Your own shopping app including products and prices updated on a daily basis. Stay visible for customers at all times with your entire product range. Bad if you have the wrong one! Half of all customers now compare prices online. In the age of the smartphone and the ubiquitous internet, they now often do so on the spot - directly in store! Brick and mortar retailers are faced with the new challenge of how to respond to this unprecedented price transparency. That is where our StoreShip price comes into play! The brodos.net kiosk makes the huge product range visible at the PoS and helps you as a retailer offer a choice and prices which can compete with the internet. Most purchase decisions are made at the PoS. Display offers and commercials in real-time directly in store and grab your customers’ attention. No matter whether you want to keep your ERP system or have not installed one yet. With the brodos.net backend cloud it is easy to manage you omnichannel solution. This is where all activities and channels merge, all the way up to fulfilment. With brodos.net you have a coordinator who takes care of everything. From transferring the order to the most reasonably priced courier service, to email communication, to invoicing and settling accounts. The feedback we have received from our customers has been positive without exception. Customers appreciate the (digital) trend we are now part of, being able to see every single product in the Kiosk and the option of being able to choose home delivery. My aim is to show customers that they can get the products offered by Amazon and co. locally, from one of my stores. This does not only ensure that jobs are kept, the customers also receive good advice and service in store. 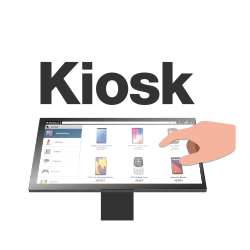 With the kiosk system from brodos.net I can offer my customers more than 250,000 items directly in the store and if desired have them delivered directly to their homes. For every customer we find the right product and the right handling - guaranteed. I have had my store transformed into a connected store and am very happy with it. What I like best is that I can incorporate my own ideas as well, and that I now have a really great concept to work with.